Ben & Jerry's releases a new dairy-free version of Chocolate Chip Cookie Dough to their Non-Dairy frozen dessert line along with new Chocolate Caramel Cluster. Made with almond milk, Non-Dairy Chocolate Chip Cookie Dough features vanilla non-dairy frozen dessert with chunks of chocolate chip cookie dough and fudge flakes. Non-Dairy Chocolate Caramel Cluster features chocolate non-dairy frozen dessert with peanuts, fudge chunks, and salted caramel swirls. 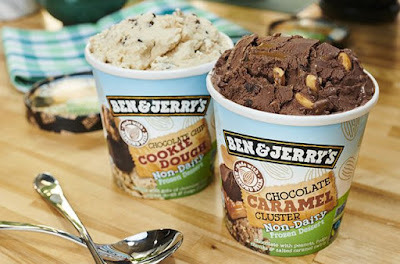 With the two new additions, Ben & Jerry's Non-Dairy line now features 11 different varieties. You can find both at retailers nationwide with a suggested price ranging from $4.48 to $5.99 per pint. You can also find Chocolate Chip Cookie Dough at participating Scoop Shops.